REDKEN flew this little fox up to Sydney for MBFWA, AKA Sydney fashion week, aka the best week ever to celebrate fashion! I was in Sydney for 48 hours, literally. But why you ask? To be part of the #BlondageArmy of course! I partnered with REDKEN for the new launch of their latest and greatest product for blondes! The new range is called "Blondage" it's a shampoo & conditioner colour extend. The UltraViolet Pigment and Proteins in both shampoo & conditioner removes yellow tones (brassiness) and enhances shinier, healthier blonde hair. Since, of course, my blog is called Le Blonde Fox, it was a perfect collaboration. It was a whirlwind of a time, but an exciting one at that. So below, I've written I did in 48 hours for you beautiful foxes! PS if you don't want to read the whole article if you scroll to about 11 am, that's where I've written about the runway shows. Feeling like a little kid like the night before Christmas, I was full of excitement. I didn't know what to wear, and yet, here was me preaching to others to pre-plan their outfits a week before fashion week.... pfft yeah right, I didn't do this! I had no idea because I wasn't planning on going to fashion week this year, so it was really unexpected! I quickly put together two outfits and packed them into my pink Juno. This suitcase is my go-to when travelling, so for a 48-hour trip, it was just perfect! I packed my make up, booked my cab for 6 am and laid out my "jet-setter" outfit for the plane. 5 am: I woke up early because my flight was leaving at 7.30 am. I had a shower, prepped my skin, which was my skincare routine and foundation. I decided instead of having a full face of makeup during the flight that I'll do it in the cab in Sydney instead. 6 am: The taxi arrived, I scooted out the door with my luggage and hopped into the cab. It was still pitch black outside as we drove to the airport. When we arrived, I checked in using my phone and went on through to the terminal and grabbed a coffee. While I was waiting to board, I received a text to attend another show for the day! I had only planned to see one show when I had arrived. The second was Emilia Wickstead down at Coogee beach. I was super excited. 7.30 am: I boarded my flight, put my headphones in and listen to John Mayer on repeat. I might, or might not have a slight obsession with his new song out right now "New Light", and it may or may not have been on repeat for the duration of the whole flight. I refuse to confirm or deny any of the above. During the flight, I looked out the window and checked out the clouds, pinching myself! I was so excited. 9.30 am: I arrived in Sydney, and the sun was shining! I hopped into a cab, and during my ride to the hotel, I quickly applied my make up for the day. The cabbie caught my eye in the reversion mirror, we both laughed. Of course, I did my signature look, the winged eyeliner. 10.15 am: (legit) En route to the Carriageworks. I grabbed a coffee inside the venue and met with my REDKEN team. We went backstage so I could get my hair done for the day. I had not one hairdresser, but three curling my hair. Backstage had the most amazing vibe. 11.30 am: – We are Kindred Show. Being a guest of REDKEN, I sat front row, right at the entrance of the runway. The floor of the runway was mirrored, and there were blooms everywhere, it was like being inside an enchanted flower garden. The sister duo Lizzie and Georgie Renkert created feminine, whimsical and picture-perfect outfits, their dresses had lace and frill details, and floral patterns that made you think of summer in Capri for their Resort 19 collection. 12 pm: Straight after the show, with no time to spare, I jumped into a cab to Coogee beach to Wylie’s Baths for the Emilia Wickstead show. La Roche-Posay was the main creating the Beauty Look (Skincare + Makeup) for WWW.MATCHESFASHION.COM x EMILIA WICKSTEAD show. I had Backstage Access, and couldn't wait to get there to check it out. 12.20 pm: I arrived at Wylie’s Baths. It was beautiful the water was glistening in the sun as the waves rolled in. I had backstage access I was able to have a sneak peek of what was to come. Makeup Artist, Isabella Schimid created a holiday-inspired mood for the Emilia Wickstead Show at MBFWA Resort 2019. The look was anchored by a flawless skin with a hint of sun-kissed colour created with LA ROCHE-POSAY’S new cosmetics collection. 1 pm: The four-piece brass band played as guest arrived, along with peach martinis, fresh prawns and salmon served on silver spoons. The theme was in full swing we were transported back to the 60's. It could've been an episode of man men mixed with Audrey Hepburn vibes. 1.15pm: The Emilia Wickstead show begun, the models briskly walked down the staircase, and found their spot under the umbrellas. Some played cards, while others read and took photos of one another. 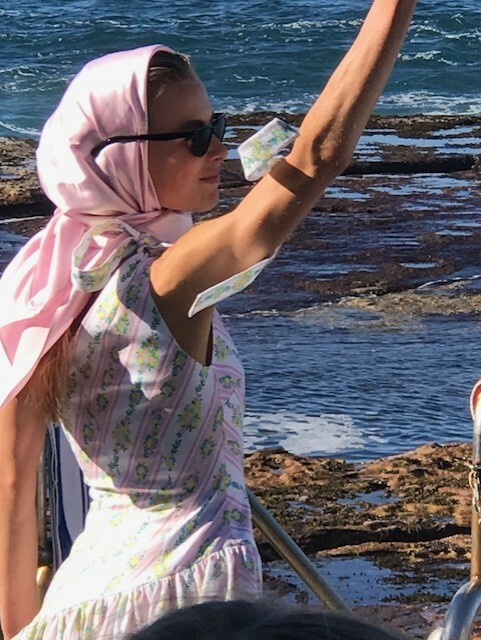 The main goal was Slim Aarons-style fantasy, and Emilia did just that for the Matchesfashion vacation-wear collection. It was the most romantic, captivating show I'd ever seen. 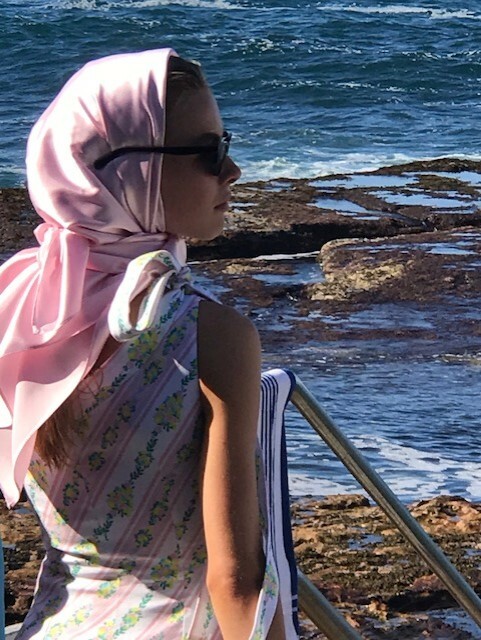 I felt like I was inside a 60's beach movie! I loved it. After lunch, I headed back to the hotel and packed, and chilled out until the following day. 8 am: This was a really exciting day because we were shooting a video for the Blondage Army campaign for the Journal Magazine. I woke up, had some oats. I got ready did a winged liner and put on my mega cute outfit for the day! I also had to pack away my clothes back into my suitcase. 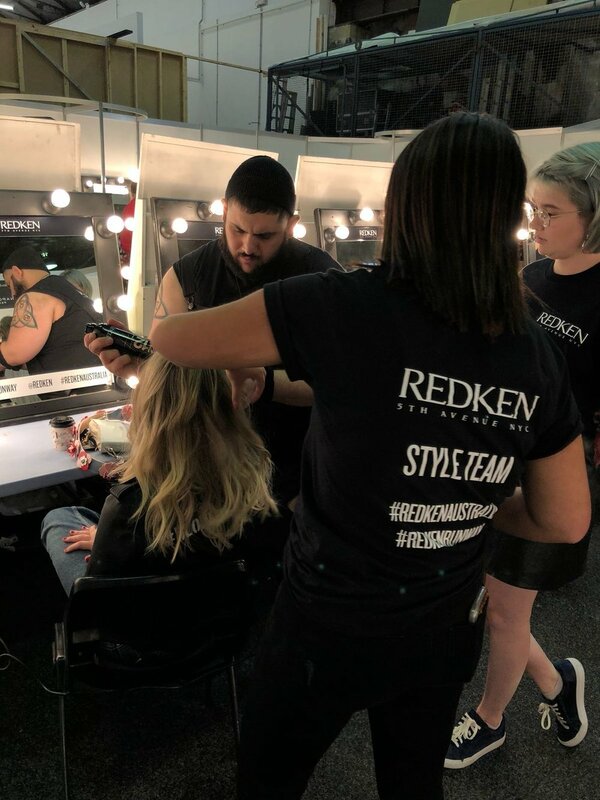 9 am: I arrived at the carriage works, I went backstage for the REDKEN team to create a new hairstyle for me for the Acler show. 10 am: Acler Show. The runway was dressed to impress with mirrored circles hanging in the centre. I sat front row, and as the models walked past, you could see each outfit from different angles, including the makeup. I loved the makeup by LANCÔME for this, the director of artistry for LANCÔME is Lara Srokowsk. The makeup look for Acler was designed to complement the colours of the collection incorporating a touch of orange. They used L’Absolu Rouge 160 as the blush for runway flushed cheekbones and also uncorrelated this into the eye look partnered with the earthy tones palette of Hypnose Beige Brulée. 12 pm: After the Acler show, the Lancome team and I went out for lunch at the Grounds of Alexandria to chat all things beauty! I love this place, it's so cute, magical and the flowers smell amazing there! They also have the best menu. 1.30 pm: We caught an Uber back to base, aka The Carriage works. Fashionistas were out in full swing and street style photographers were at arm's length. 2 pm: The Blondage Army all met up to go backstage to film for the Journal Magazine. Around this time we also went outside, and the photographers went literally in a frenzy! They were all wondering who were all these blonde girls wearings #BlondageArmy jackets?! Little did they know, we were about to launch a groundbreaking product for all blondes across the globe! 4.30 pm: After filming for a few hours, the Blondage Army made their way into the ROOPA show to sit front row all together! It was such an exciting experience being all together. The #BlondageArmy sat front row and watched the beautiful collection of embellished silk coats, silk pieces and bright colours. 7 pm: It was the one and only, IAMGIA show. This one was a biggie it had been the most anticipated show of the night. Those waiting to enter the show lined up all the way down the block. I remember I was waiting near the backstage door entrance to go in as we waited to get our backstage passes. Backstage models were posing for the cameras, and makeup artists were flying up and down, while the hairdryers were blowing at full force. The show was running overtime. There were a few rumours that were flying around that Kendall Jenner was walking for the show too. The hype back there was major. 7.30 pm: The show started, it was running a little late. The lights dimmed red and the models paced fast as they burst through the plastic straps hanging from the entrance almost like back in the day when you walk into a milk bar or a butchers shop in their 90's outfits. There was no Kendall Jenner, but some of the outfits were risqué, bold and fresh. 8.00 pm: I quickly jumped into a cab from the Carriage Works back to the hotel to pick up my luggage, I also changed back into my comfortable jet setter leggings and jumper and went back to the airport. 8.30 pm: I had dinner at the airport; burrito bowel and removed my make up. It's interesting to see everyone in one spot travelling to different destinations. During my downtime here, I tried on some sunglasses, read a magazine (yes I still read them) and waited until I had to board my flight. 9.00 pm: I board the plane, ready for home and bed. 10.30 pm: Landed and got a cab back home. Unpacked and thought how thankful I was to experience such an epic trip. It's times like this that reminds you why you're doing what you're doing and how much you love it. This was such a whirlwind of adventure foxes. The best experience ever, and thank you so much for reading this journal entry. Thank you REDKEN for having me! 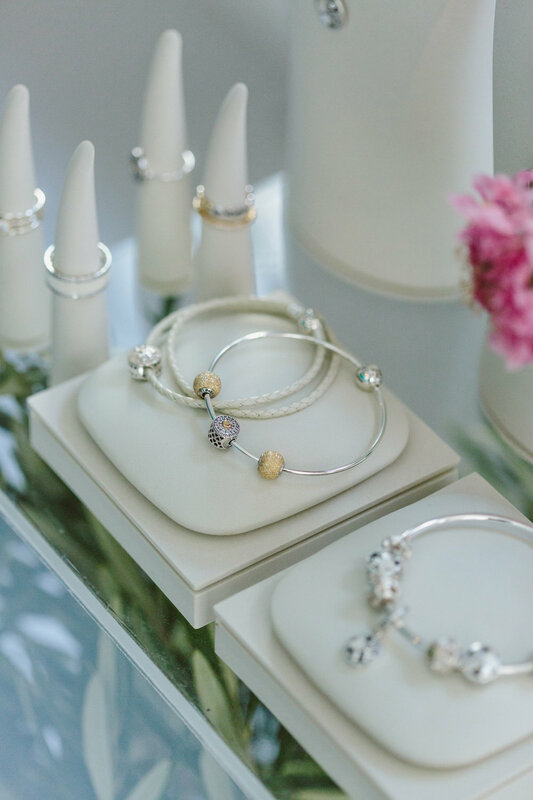 Pandora's timeless pieces are handcrafted and made to perfection. Pandora celebrates friendship, love and milestone moments in our life that we cherish so much. 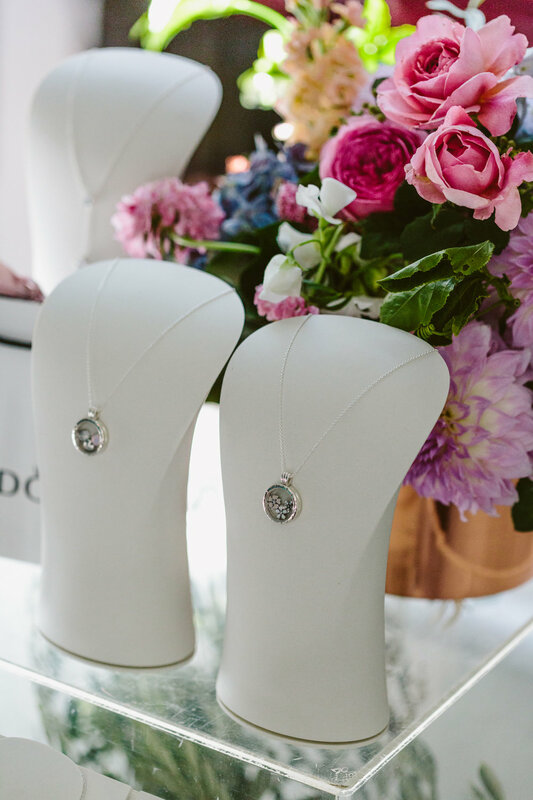 In celebration of Pandora's DO motto, bloggers were invited to a morning brunch to see PANDORA’s new 2017 Collection. Their taglines #DOPANDORA along with #DOBold, #DOShine, #DOBloom, #DOCreate, #DOCelebrate and #DOStyle is all about being You! Achieving whatever you want to do and to celebrate what makes you-you and to embrace it. The collection is divine, from the different combinations to stack your rings, or to add jewels to your charm bracelet are too cute, and the earrings are just perfect for any occasion. Check out the full range at pandora.net! Thanks for having me Pandora. To start the year of fashion, savvy fashionistas were out in full force at the Alfa Romeo Portsea Polo last Saturday. I was invited by Alfa Romeo to attend, and what a delight it was. The marquee was styled to perfection, besides Melbourne's typical temperamental weather it resulted in a beautiful sunny day! Customised cocktails were sipped by attendees, and tuna delights were served. Playsuits in pastels colour schemes and dashes of white outfits were of choice for the seaside event. Pieced perfectly with ribbon hats and summer boaters, having a relaxed Italian vibe throughout the day. The Vampire Diaries and its spin-off series The Originals my inner fan girl inside was super excited to see her in real life!) was in a vibrant colourful dress, I admired from a distance, such a beauty. Keeping in iItalian summer theme, I wore this little number from Thurley with my summer boater from Ace of Something. I watched some of the Polo, it was so mesmerising watching the horses so sync with their player, they're so well behaved it was just beautiful to watch. A memorable day that will never be forgotten.